Four-year-old Jackson walked patiently around the AP psychology class, holding one of the devices that makes him so special and letting the Williston Northampton School students gently touch his head. 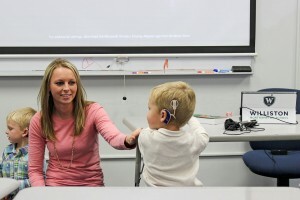 On the floor, his two-year-old brother, Chase, played with stuffed toys, while at the front of the room, his mother, Corinne Walters, explained to the class the process both boys had gone through while learning to use their cochlear implants. 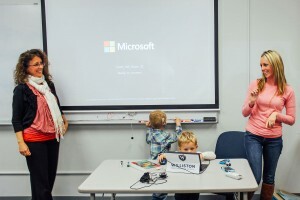 On Friday afternoon, Ms. Walters and her sons, both of whom were born deaf and have been gradually adjusting to life with implants, were in class to provide a hands-on component to a unit on sensation and perception. Students in the psychology class leaned over their desks to ask questions about the implants as the boys played and doodled on the white board. The visit was a serendipitous one. Since Williston Northampton science teachers Amber Rodgers and Christina Berghoff share a classroom, when Ms. Rodgers left the words “cochlear implant” on the white board after her lesson, Ms. Berghoff spotted the note and mentioned that she had both previously worked with deaf students and was still helping to assist the Walters family. By bypassing their ears and tapping directly into the auditory node in their brains, the cochlear implants allow both boys to hear along a wide range. Ms. Walters explained that the process of adjusting to the implant is a long one, from the shock of the first sounds, to learning how to adjust to voices, to repeated auditory tests. The boys had continued to learn sign language, and took off their devices at night, but Jackson, in particular, could now hear everything down to a whisper. “He’s hearing pretty damn good for being deaf,” Ms. Walters explained with a laugh. The implants also came with a high-tech component: they were Bluetooth enabled. That meant that Ms. Walters could carry a small device, speak into it, and the boys would hear her across a crowded room or in a grocery store. To demonstrate, Ms. Berghoff went into the hallway with the remote and closed the door. Chase, who had been playing on the floor, stopped and turned toward a comment only he could hear. Ms. Berghoff returned to the room, smiling. “I usually ask kids what color their shoes are,” she said. After class, Ms. Walters said that the class visit seemed like a natural progression of small outreach efforts the family had already been doing: Ms. Walters teaches baby signing classes at her local library; Jackson had used his implants for show and tell at school. With no prior history of deafness in her own family, Ms. Walters said she had been forced to start learning about auditory systems from scratch after Jackson was born. 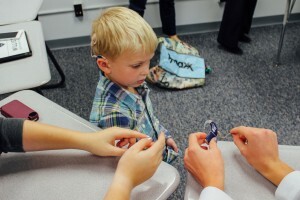 Ms. Rodgers said that having the Walters family visit had been a particularly informative way for students to understand how sound travels through the ear—particularly since the students had been able to use what they learned to ask informative questions.